Dock diving, or dock jumping as it is also known, is a fun new sport in which dogs compete in jumping for distance or height from a dock into a pool or body of water. The sport first appeared in 1997 and has since grown exponentially in popularity. A number of organizations run dock jumping competitions including DockDogs and Splash Dogs. K9 Central’s dock jumping trainers are intent on getting you in the game. We will introduce your dog to the dock, help you to build focus and drive, and work on increasing your dog’s strength and lift. Before you know it, you too will catch the dock jumping fever! In this fun course you will learn shoreline training, jumping and catching, rear end awareness, and how to build toy drive, all skills used to build successful dock diving techniques. 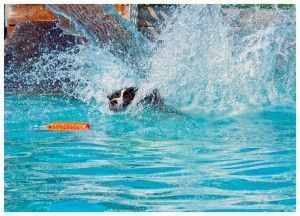 You and your dog will become familiar with the pool and dock by playing motivational games. Small progressions using the “place and send” method which is used to build the confidence in your dog to jump. If you are already have dock competition experience we will work with you and your dog at their current level. Beginner;Dogs that have never jumped off of a competition dock: Basic Manners (Bridging the Gap or Recall is optional) and your dog must listen to you off leash. Intermediate;Dogs that have some dock jumping experience: Basic Manners & Beginner Dock Diving (Bridging the Gap or Recall is optional) and your dog must listen to you off leash. Please email info@k9central.ca or call 905-623-3940 if you have any questions or would like to register.